Historically, Title I school children do not always have the best resources available to them. Those elementary schools are classified as such because they have a high number or high percentage of children from low-income families. For the second time in as many years, ExxonMobil is making a richer education available to children in Title 1 schools and throughout the Baton Rouge community through Trees & Trails at the LSU AgCenter Botanic Gardens at Burden. ExxonMobil’s donation will provide admission and transportation expenses for underserved children in Baton Rouge and Baker. Emphasis will be made to engage students enrolled in ExxonMobil’s partner schools. Trees & Trails brings students in touch with nature through a 5-mile series of pedestrian, recreational and educational trails. Using math and science skills, the program stresses the importance of the ecosystem and the environment. Through hands-on activities at multiple learning stations, students ultimately strengthen their critical-thinking, team-building and problem-solving skills. Trees & Trails is based on an award-winning national program called Project Learning Tree. The program uses the forest as a natural “window” on the world to increase students’ understanding of the environment, stimulate critical and creative thinking, develop their ability to make informed decisions on environmental issues, and instill in them the commitment to take responsible action on behalf of the environment. According to Project Learning Tree, studies consistently show that, when integrated into the core curriculum or used as an integrating theme across curricula, environmental education raises test scores, increases student engagement in learning and improves student achievement. 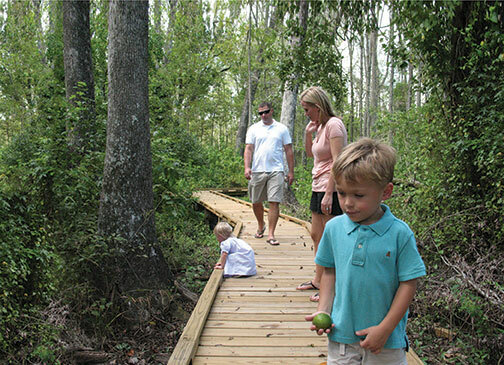 Among the long-term plans for Trees and Trails are increasing school and docent recruitment; establishing partnerships with public, private and parochial schools; and expanding educational programs to include wetlands education developed in partnership with LSU AgCenter’s Youth Wetlands Program.